I have been using a competitor brand solution for years and every once in a while, it just makes my eyes dry, red and sometimes my contacts will just float around in my eyes! 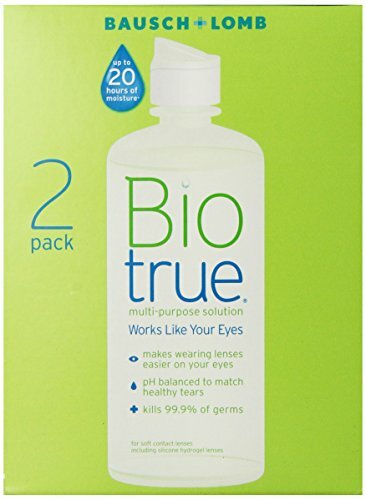 I was lucky to receive a sample of BioTrue and have been pleasantly surprised how great my eyes feel since switching. I have had 1 time where my contact just didn't want to cooperate since sampling BioTrue, but nothing compared to the competitor brand! I definitely recommend using this brand! Especially if you have been unhappy with your current solution! I love this stuff! I was trying to wear multi focal contacts so I could throw away reading glasses. My eyes were getting too dry to wear my trial pair of contacts until one of the Eye Dr. staff told me she was using this Bio True and it was so much better than the other brand I was using. I tried it and I can't tell you how much better the contacts felt and worked! I am now able to wear them and was able to throw away the glasses.